Liesl and I have been asked to lead a service at the York Corps on August 7, and it’s apparently my turn to preach. Now, I’m due to have knee surgery on Tuesday (if I don’t there’s a whole heap of other problems happening, but I’m not going into that), which means I may well be on crutches when we do the service. So I’m planning to preach sitting down. Jesus often sat down while teaching, so why shouldn’t I? 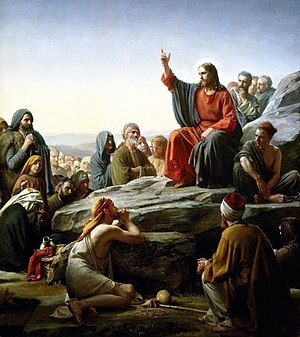 It got me thinking about the times Jesus did sit down to preach, which mostly appear in Matthew’s gospel. This is all because Matthew’s gospel was written for a mostly Jewish audience, where Teachers would teach seated. So there’s the Sermon on the Mount, and the parable of the Sower and the seeds that fall on various ground, but these didn’t seem to grab me. I turned to chapter 14 and read of the feeding of the five thousand. After this, I read the relating passage in the Tyndale commentary that we were given a while ago and I now have a bookcase to display them so I grabbed this commentary and this little bit sparked an idea. As the day wore on, the disciples urged Him to discontinue His healing activity and to send the crowds away to obtain provisions before it was too late. Jesus, still moved with compassion for the hungry, shepherdless throng that surrounded Him, decides to use His miraculous power to satisfy their needs. But first He brings home to His disciples indirectly the fundamental truth that he has called them to be shepherds of the new Israel which constitute the Messiah’s flock, but that they will never be able to discharge that function in their own strength. All the power necessary for ‘feeding the sheep’ comes from Him, the chief Shepherd of the flock, and from Him alone. Such would seem to be the significance of Jesus’ words “They need not depart; give ye them to eat.” When they point out that their available supplies, “but five loaves, and two fishes” are totally inadequate for a catering task of such magnitude, He bids them bring their resources to Him; and in His hands they become so wonderfully multiplied that when the disciples receive them back from Him and distribute the broken pieces to the people they are found to be more than adequate for the entire company. Reading this passage sparked a light in me. When Jesus says “They need not go away; you give them something to eat” (NRSV), he’s telling the disciples that they are able to feed the people spiritually. Yet they aren’t able to see past the physical needs into the spiritual needs. And then as the commentary points out, it is only through Jesus, the “chief Shepherd” that we have the power to feed five thousand people, spiritually, and when we come to him, when we rely on him, we are able to do the seemingly impossible. So, that’s where my thoughts are at a couple of weeks out from the sermon. We’ll see how they turn out. But for now, a question for you to think about: Do you think you could feed five thousand? If not, how many could you feed?